Before to read this post you must be aware which the material exposed make uses of undocumented windows functions, so you must know the risks involved in using them. If you are not comfortably with that please skip this post. 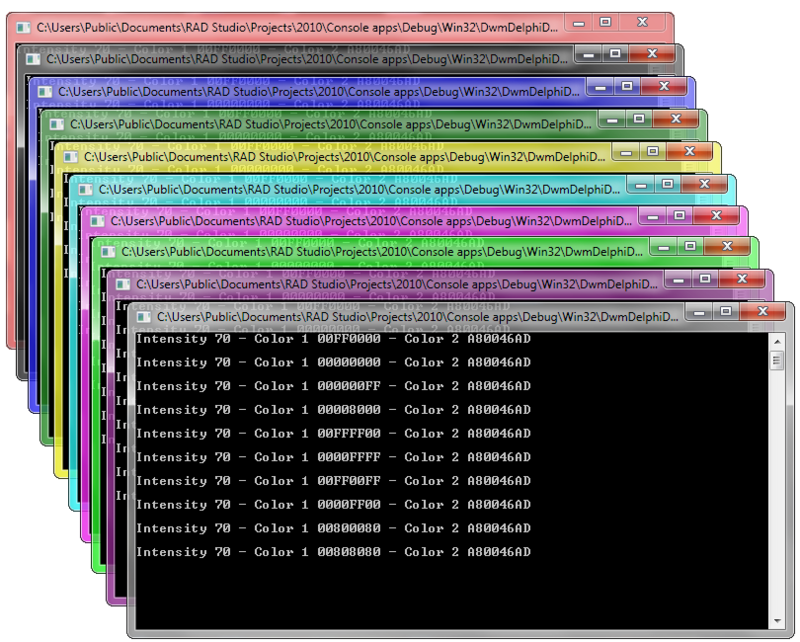 Some days ago reading this article, I found a very nice application called Aura (Written in C#), which calculates average color of the desktop background image or the active window icon and sets it as Aero Glass color. After of that, I check the Desktop Window Manager (DWM) reference to find the functions which allow change the color of the glass in Windows Vista/7, but I can’t found any documented function to do this. Finally digging in the source code of the Aura application I found two undocumented functions called DwmGetColorizationParameters and DwmSetColorizationParameter which makes this task. Then I check the parameters, the call conventions and finally I took the dwmapi.dll file and after of analyze using IDA and the Microsoft public symbol server, I found a lot of undocumented functions. This is the dump of the exported functions of this library (dwmapi.dll) , as you can see exist a lot of undocumented functions. Now using the Microsoft public symbol server we can obtain the undocumented functions names. //Author  : Rodrigo Ruz V.
Finally just for fun I wrote a similar application to Aura using delphi (just in 240 lines of code ;P and without Net framework) and this is the result. You can check the source code of this application on Github. Categories: Delphi, DWM, WinApi | Tags: Delphi, DWM, winapi | Permalink. Using the DwmEnableBlurBehindWindow and GetConsoleWindow functions , we can apply a nice glass effect to our console applications. Categories: Delphi, DWM, WinApi | Tags: console, Delphi, glass effect, windows 7 | Permalink.